Ulla Lohmann and Sebastian “Basti” Hofmann, the South Sea Specialists, go on adventure closer to their own home in the Alps to minimalize their ecological footprint and to raise awareness for the fragile mountain habitats. They will climb every European Countries highest mountain and meet people all across Europe who work towards achieving the United Nations SDG’s, the Global Sustainable Goals. Not only an interesting expedition in itself, but also a journey towards the greatest adventure of their life…. I am pregnant! In less than 2 months, and we’ll be three… it was not planned like this! We were supposed to start our project and would have loved to be already at the top of Elbrus, with 5.624 meter the highest point of Europe. Basti, responsible for planning the route and the more reasonable of us, decides to start with the lowest highest mountains. That’s why we find ourselves climbing the Vaalserberg. Climbing? More likely „driving“ the mountain…. In reality, the mountain is 700 Meters, because the Belgians made a hill and built a stone pyramid on top, to make their highest mountain a bit taller. Even higher is the new radio tower with its parabolic antennas to exchange date in real time between the London Stock Exchange and the Frankfurt Stock Exchange. What would happen if we’d fly our drone right here? Access: In the middle of nowhere, find a dirt track and drive 200 meters, gaining approximately 20 meters of altitude. Then, park and walk 20meters over a cow paddock with fresh cow dung. The highest point of Luxembourg lacks attraction. With its 20 000 inhabitants per square kilometer, the Principality of Monaco is the world’s most densely populated country. Half of its inhabitants are said to be millionaires. Quite needed with the price of land! 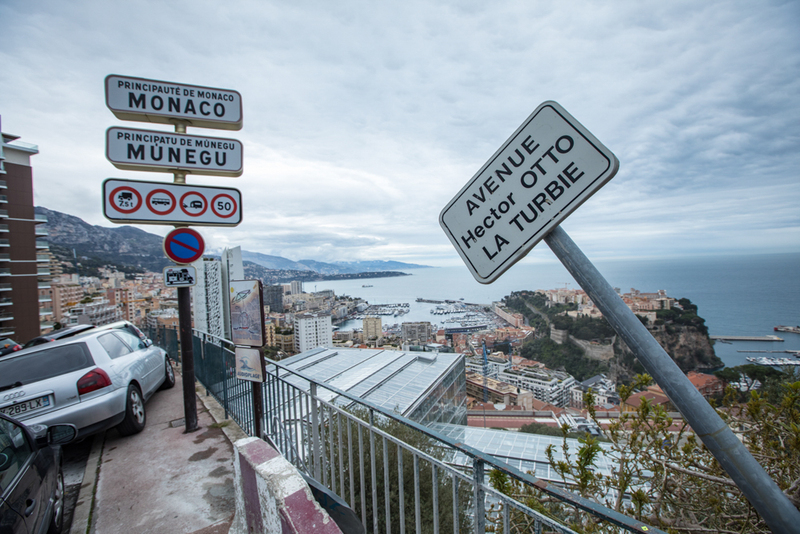 One square meter costs around 50 000 Euros and makes Monaco the most expensive place worldwide. But for a name or even a sign to indicate the highest point of the country, there was not enough money. We search and search…. Who believes that our project is purely about true Alpinism, will learn the latest in Vatican that the reality is very different. In the world’s smallest country waits what might be the world’s longest queue. We have to wait for hours in the burning sun to get access to climb the Dome of the St Peter’s Basilica, the highest point of the Vatican. By the way, it is the country in the world with the highest crime rate per head, but the prison has only space for two people. Finally, a mountain to suit our taste! 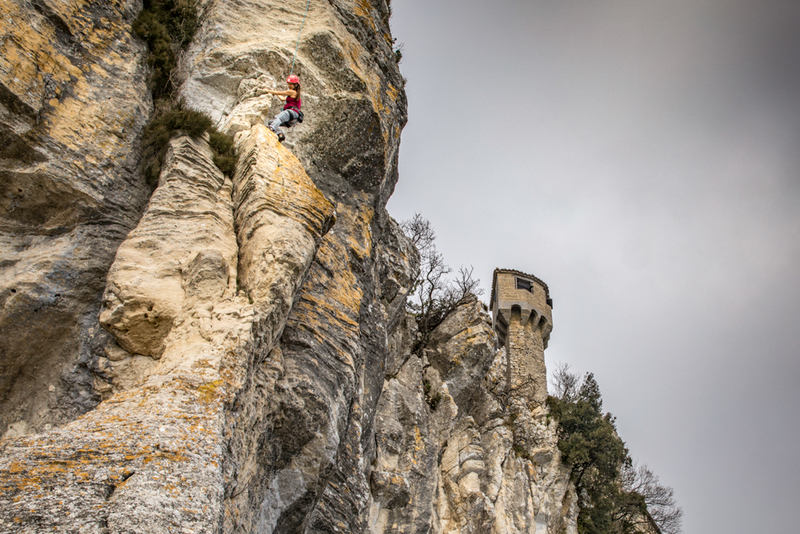 Here is a climbing area and we can rock climb to highest point of San Marino, the oldest republic in the world. A great reward after the steep hike through the city with the same name, bustling with tourists. Over two million guests come every year to visit the tiny town of 4000 habitants and over 1000 shops. The right place for me since I love nothing more than shopping….